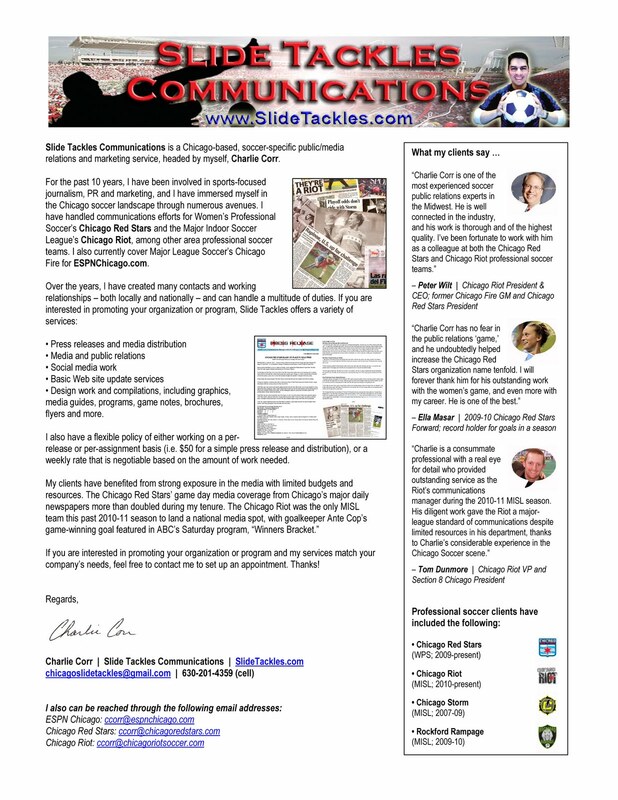 Slide Tackles Communications actively provides a number of services for clubs, organizations and clients in soccer. 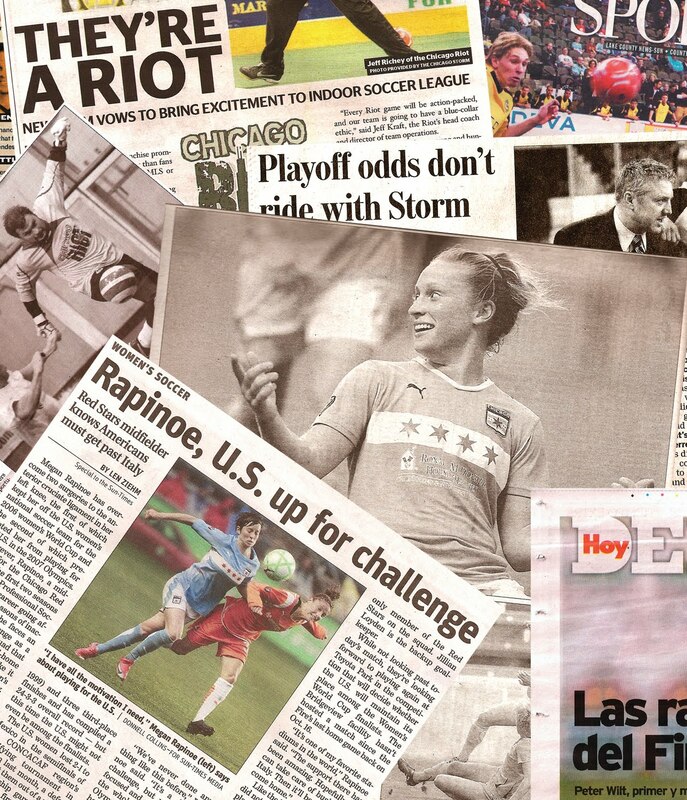 Public/media relations and marketing efforts have ranged from professional teams such as the Chicago Red Stars, to individual high-profile clients such as legendary Brian McBride's Attacking Soccer Academy, to elite club-level focus and promotion for Eclipse Select Soccer Club. I founded Slide Tackles Communications with the mindset of catering to the nuances and knowledge of this fine sport, combined with a growing network I have been fortunate to build. I am currently based in New York City as a member of Major League Soccer's communications department. If you are interested in promoting your organization or program, Slide Tackles offers a variety of services that are listed below. Also listed is my background and clientele. If my services match your company's needs, feel free to contact me to set up an appointment. • Design work and compilations, including graphics, media guides, programs, game notes, brochures, flyers and more. CLICK HERE for my flyer. • United Soccer League: 2015-2017 -- Wrote press releases, feature pieces and more for the USL, a U.S.-based professional league that gained Division 2 sanctioning during my tenure. I also provided content for the PDL and Super-Y League sites and some on-site coverage for postseason tournaments. • U.S. Soccer Federation: 2012-2015 -- Handled communications ranging from the Development Academy and Youth National Teams to the U.S. MNT and WNT squads. Served as press officer for the U.S. U-20 MNT at the 2013 FIFA U-20 World Cup in Turkey and the 2013 Concacaf U-20 Championship, as well as the 2013 Concacaf U-17 Championship. • Eclipse Select Soccer Club: 2011-present -- Promote the elite club-level organization, which was ranked No. 1 Girls Club by Soccer America in 2007 and 2008. Along with the club's in-season play, content is generated on players' college commitments and post-club accomplishments at the collegiate and professional ranks. • McBride's Attacking Soccer Academy: 2011 -- Promoted the academy's summer camps program in 2011, led by U.S. soccer legend and Arlington Heights, Ill., native Brian McBride, gaining attention in Chicago's major daily newspapers. • Chicago Riot: 2010-11 -- Served as the Major Indoor Soccer League team's communications manager. The Riot organization was the only MISL team during the season to land national media acclaim as goalkeeper Ante Cop's game-winning goal was part of ABC's Saturday show "Winners Bracket." 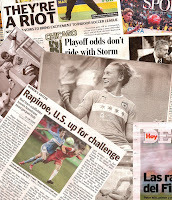 • Chicago Red Stars: 2009-11 -- Handled communications duties for organization during its days in Women's Professional Soccer and the Women's Premier Soccer League. Game day media coverage from Chicago's major daily newspapers more than doubled during my tenure in the 2010 WPS season, and the Chicago Tribune's coverage tripled in comparison to the inaugural 2009 season. • Rockford Rampage: 2009-10 -- Was the director of public relations for the former Major Indoor Soccer League team. The Rockford Register Star covered and previewed every home game, and TV outlets appeared at approximately half of the team's home games that season. • Chicago Storm: 2007-09 -- Held public relations and marketing roles for the former Major Indoor Soccer League organization. • Milwaukee School of Engineering: 2004-05 -- Was the assistant sports information director for MSOE's Division III athletics program. • ESPN Chicago: 2009-12 -- Wrote for Chicago's leading online media sports outlet, ESPNChicago.com, covering Major League Soccer's Chicago Fire, the U.S. Men's National Team and other international soccer. 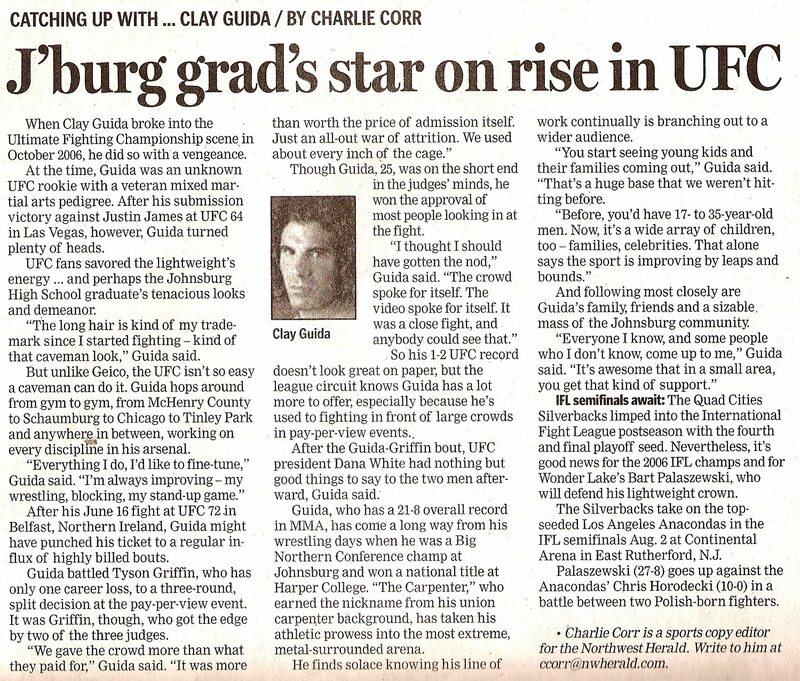 • Shaw Newspapers: 2005-07 -- Held various sports copy editing roles for the Northwest Herald, Kane County Chronicle and Lake County Journals; also contributed a "Catching Up With ..." column focused on local athletes and sports figures who pursued their respective paths beyond the college scope, such as Golden Tee creator Jim Zielinski, UFC fighter Clay Guida, U.S. WNT defender Amy LePeilbet and more. • Ozaukee County News Graphic: 2004-05 -- Was the sports editor for an award-winning bi-weekly Conley Media newspaper in Milwaukee's northern suburbs. 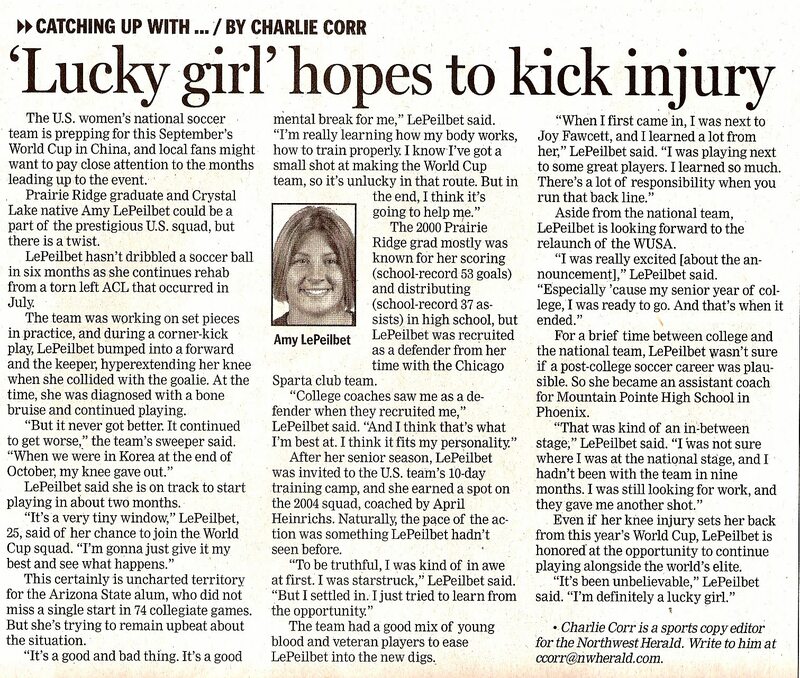 • Beloit Daily News: 2002-04 -- Served as a sports reporter and copy editor, and had the privilege of covering the likes of Prince Fielder and Rickie Weeks of the Beloit Snappers minor-league baseball team. I was born in Evanston, Ill., grew up in Woodstock, Ill., and graduated from Marquette University in 2002. As you can tell, my professional career has mostly been centered in northern Illinois and southeastern Wisconsin. I recently resided in Chicago's Albany Park neighborhood and currently set up shop in New York City. Thanks for visiting SlideTackles.com and Slide Tackles Communications!